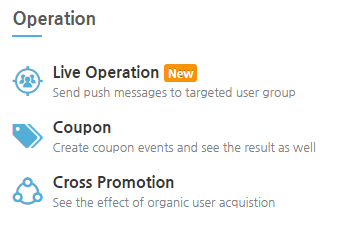 to send advanced push notifications to targeted user groups. 1-2. 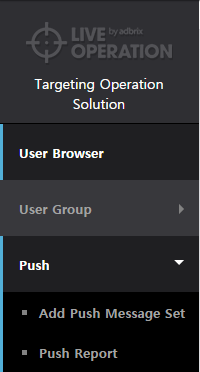 Select Push > Add Push Message Set in the Live Operation menu. 1-3. The first step for creating a push notification is to select a recipient. More detailed targeting is supported. The entire list of users can also be set as recipients. All Users: Sets every available user as a recipient. User Group: Selects an existing user group. Manual Selection: Manually selects the user data value set while integrating SDK to target. 1-4. Select the name of the campaign and the type of push notification. Normal Push: The default push notification form for sending a message containing a line or two. Long Text Push: Send a push notification containing longer text. This applies to Android 4.1 and later versions. while Normal Push applies for versions prior to Android 4.1. Image Push: Send a push notification tagged with an image. This applies to Android 4.1 and later versions. while Normal Push applies for versions prior to Android 4.1. 1-5. 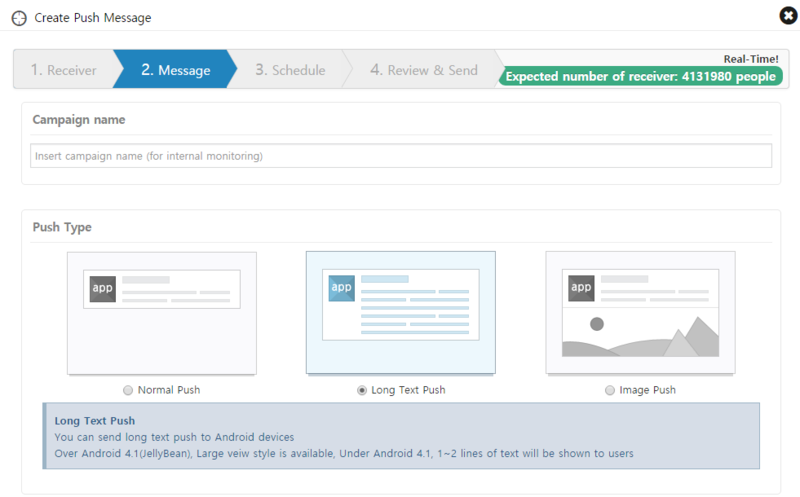 Select the push type and set the appropriate messages and options according to the selected type. Use HTMLs to incorporate bold, underline, color, and style tags to a title and message. Use Preview on the right to view the message before it's sent. Enable Notification Vibration: Supports vibration when a push notification arrives. Enable Notification Alert Sound: Supports sound alerts when a push notification arrives. Enable In-play Push Notification: Shows the selected push message even if the app is running. Deep Link: Lands users to a specific section of an app or takes them outside of the page when touching a push notification. Disable this and the app will activate when clicking a push notification. : Brings up a page to add the Deep Link location. 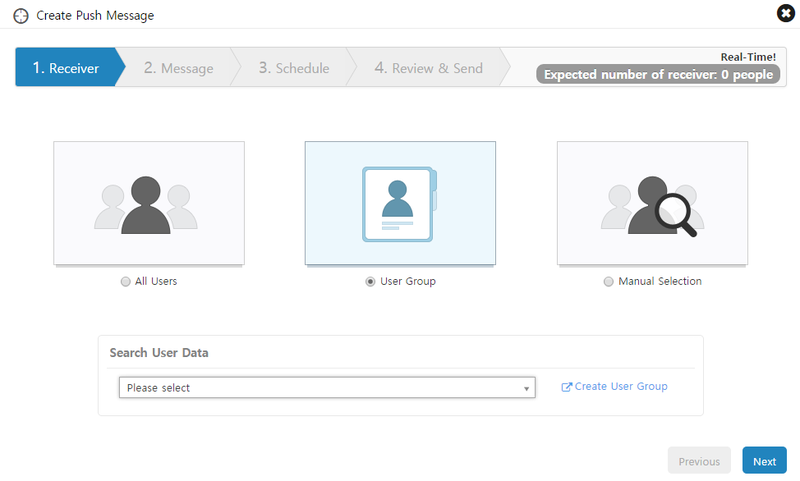 : Analyzes which message was most efficient among those that were sent to the same user group. 1-6. Set a schedule to send a completed push notification. 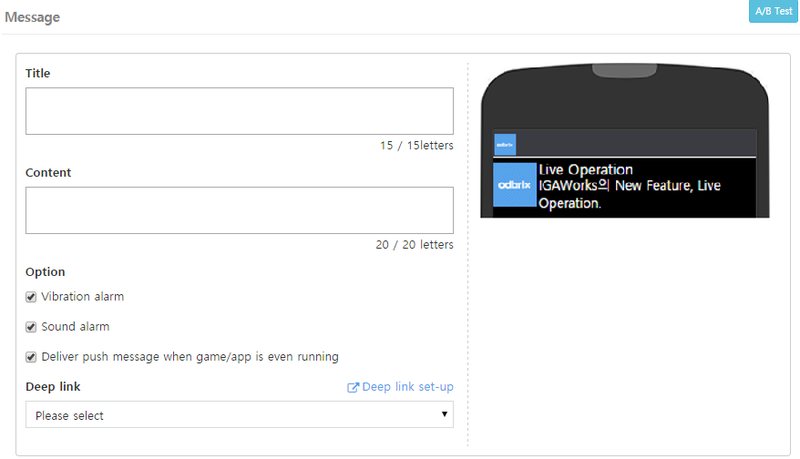 As a push message is sent according to the IGAWorks push server time, the exact transmission time can vary with the actual time by a couple of minutes. Send Now: Sends the message immediately after settings are completed. Schedule Push: Schedules the date and time to send a message. Send by Date: Sets a specific day/time to send a message on a regular basis. 1-7. After all settings are done, the completed push notifications will be reviewed. Click the Edit button to edit items respectively. When the review is finished, click the Finish button to send a push notification. : Click this to bring up a page to register and set a test device. : Click this to send a push notification created with a test device. 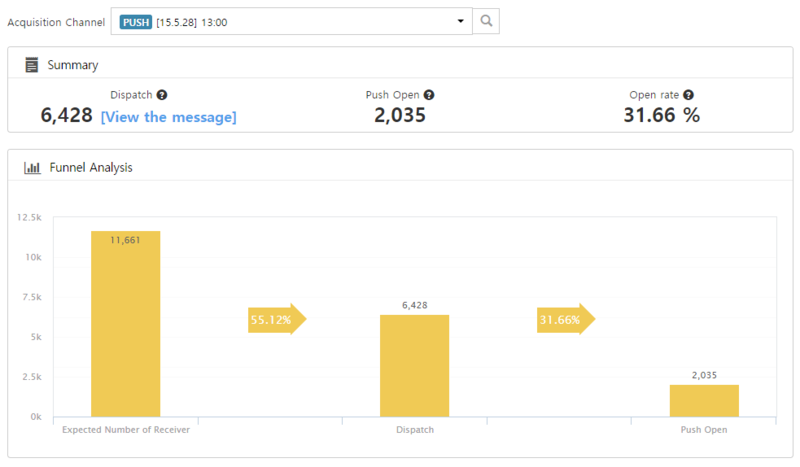 Analytics on the posting status as well as the read message status and rate of all push notifications are provided on an hourly basis. 2-1. Reserved Send: Displays the list of push notifications scheduled to be sent. After completing push notifications, go to Push Report > Reserved Send to check out the scheduled push notifications. : Move the cursor here to preview a push notification. : Move the cursor here to select recipients for the selected push notification. View Detail: Moves to the 'Review & Send' page of the selected push notification. Cancel: Cancels transmission of the selected push notification. 2-2. 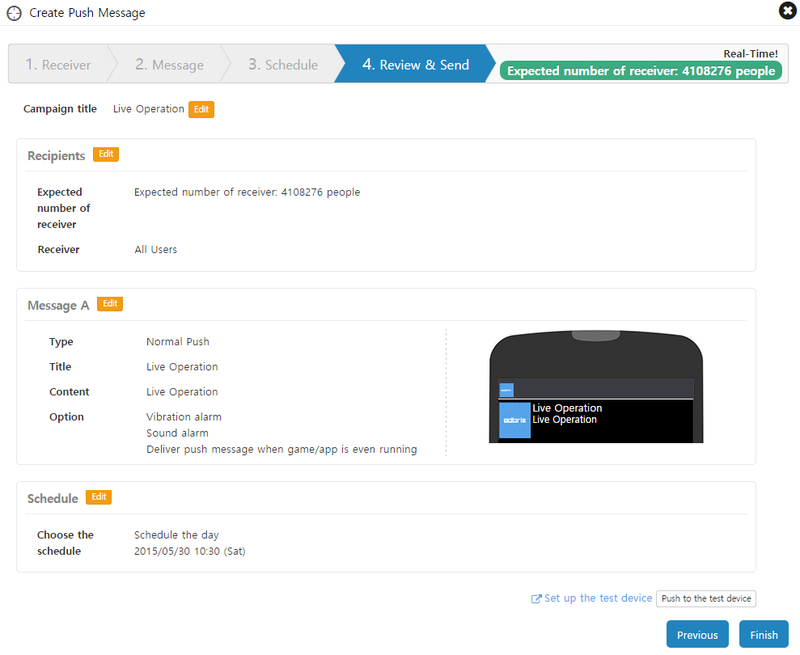 Sending Completed: Verify the general and detailed reports on the posting and read message status of notifications alongside the list of push notifications successfully sent. If AB test is enabled, you can also ascertain which message was most effective. : Takes users to the detailed report page of the selected push notification to view the data by date and time. : Moves to the Review & Send page of the selected push notification. In case the read message rate was higher, this results in a WIN , if it was lower, it's a LOSE . 2-3. Sending cancellation: Displays the list of push notifications whose transmissions will be cancelled. 2-4. Sending in Process: Displays the push notifications being sent out. Select ' ' to verify the analytics on the posting status of the sent push notifications. 3-1. 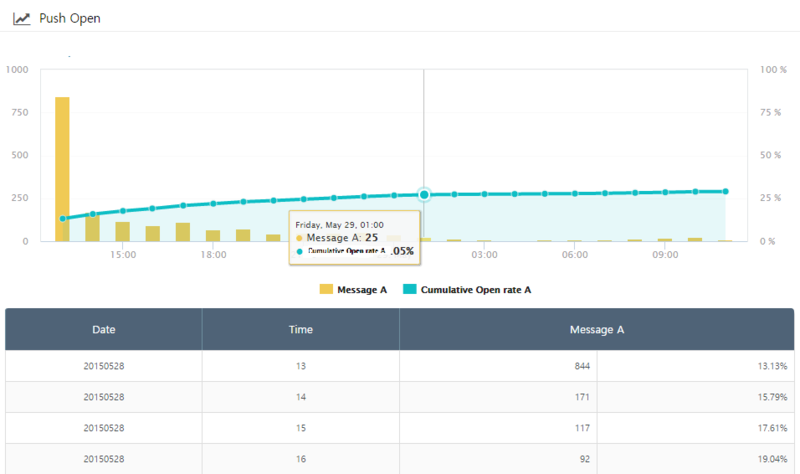 Summary and Funnel Analysis Data: Provides the number of successful posting, number of read notifications, and open rate information based on the cumulative data. 3-2. Daily/Hourly Data: Verifies the specific values on the read status of push notifications by time range and increments of the cumulative read rates. 5. Background: Solid colors or patterns.